Alex Eisen/MDN MSU's Maggie Mercer (left) slides into home plate safely to score the winning run in the 12th inning of Game 1 against Bemidji State on Wednesday inside the Air-Supported Dome at Herb Parker Stadium. The seemingly never-ending doubleheader lasted six hours and 30 minutes with the first pitch coming at 2 p.m. and the last pitch crossing home plate at 8:30 p.m.
Any fatigue, however, was masked by jubilation for the Minot State softball team Wednesday night as the Beavers (19-12, 8-6 NSIC) notched a pair of walk-off wins against Bemidji State (22-16, 5-9 NSIC) inside the bubble at Herb Parker Stadium. MSU took the first game in 12 innings, 6-5, with Lauren Cowden coming through in the clutch with a game-winning RBI single. 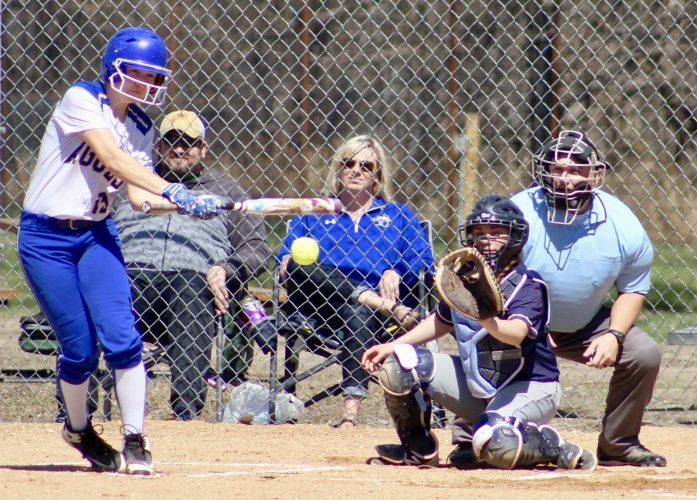 The Beavers then rallied from a two-run deficit in the seventh inning of Game 2 for an 11-10 victory and finished off a dramatic sweep. In Game 1, the Beavers opened up a 2-0 lead with an RBI double by Cowden in the first inning and a costly Bemidji State error brought in another run in the second inning. Alex Eisen/MDN Minot State third baseman Karlee Coughlin (22) stands in the batter's box with Lauren Cowden waiting on deck behind her Wednesday against Bemidji State in Minot. 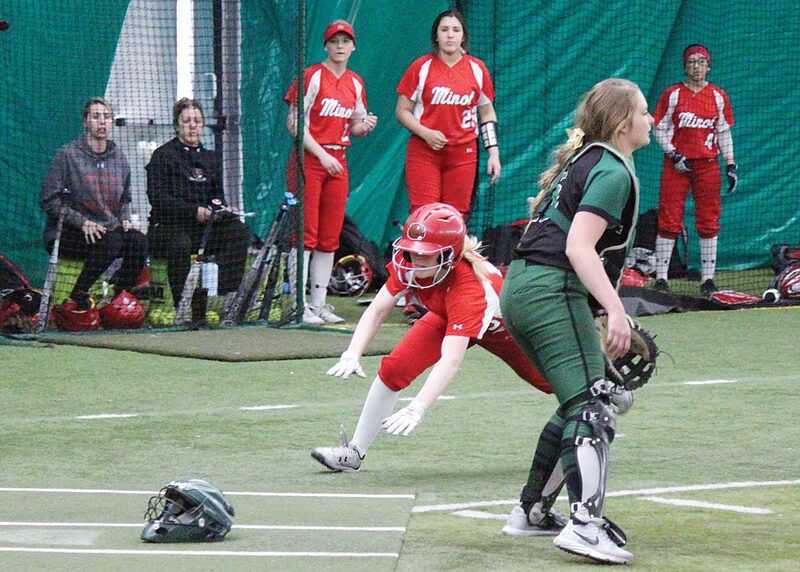 Minot State starting pitcher Laura Mendez kept BSU’s hitters at-bay until MSU gave back a run with an error in the fourth and then the green Beavers of Bemidji State put up a four-spot in the fifth to snag the lead for the first time, 5-2. Mendez didn’t finish the fifth inning and was relieved by Kylie Patrick. In the bottom half, speedster Cowden put on the jets for an inside the park home run. After going the first 28 games of her senior season without a trip around the bases and then going yard last Saturday against St. 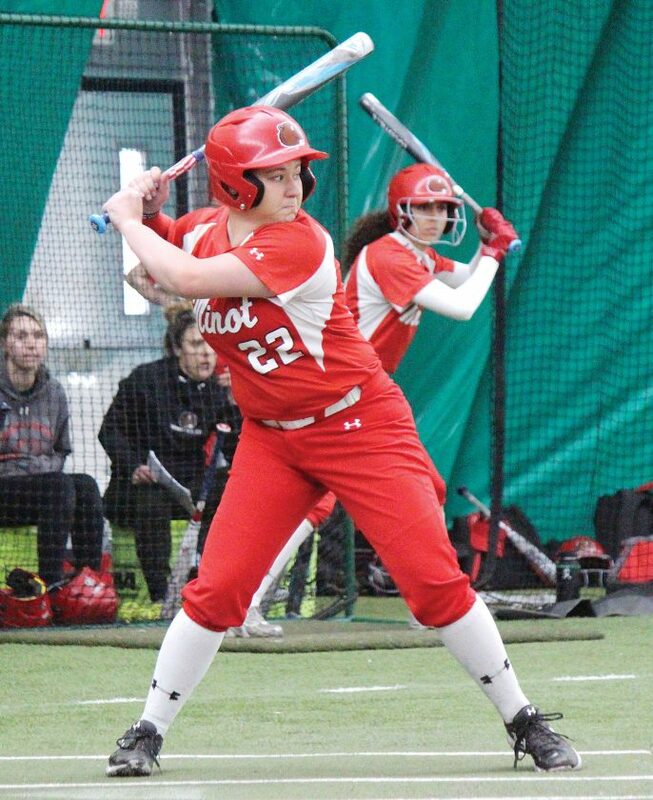 Cloud State, Cowden had put together back-to-back games with a home run for the first time in her collegiate career. 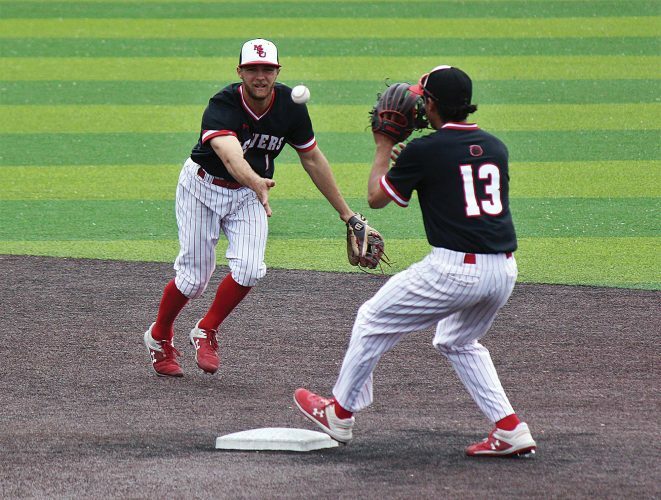 Cowden’s wheels helped spark a mini MSU rally. Later in the fifth inning, both Randi Wright and Kiera Shwaluk singled back up the middle to bring in runs and tie the game at 5-5. MSU, however, left the go-ahead run on second base. Bemidji State did the same in the top of the sixth. Minot State followed the pattern in the bottom of the seventh. Onward to extra innings, and a lot of them with both teams unable to score. 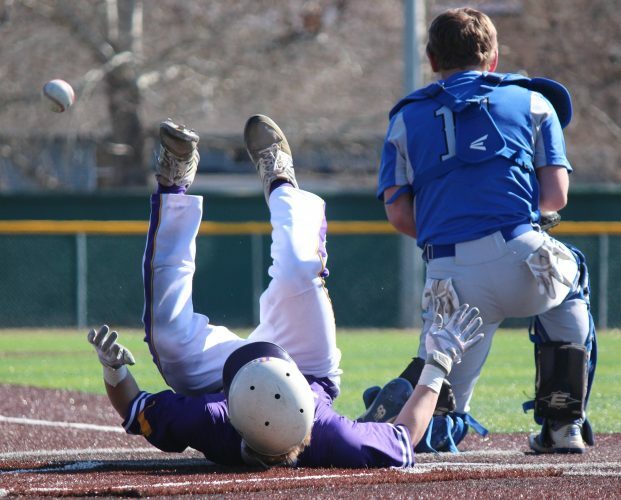 Cowden had a chance to be the hero in the 10th inning but lined out sharply to third base. She got a redo in the 12th inning and made sure the ball got passed the infield this time and brought in Mercer, ending the long drawn-out affair. The nightcap generated more offense. 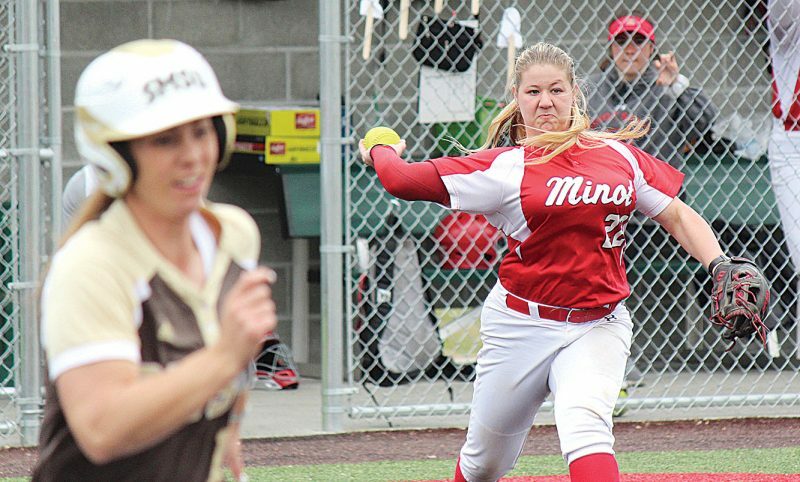 Eleven runs were put up in the first two innings with Minot State doing more damage, 7-4. One of those runs came from Wright, who sprinted around the bases for the Beavers’ second inside the park home run of the doubleheader. Bemidji State scored six unanswered runs across the fourth and fifth innings to reclaim a 10-7 lead. Wright and the Beavers still had more in the tank. 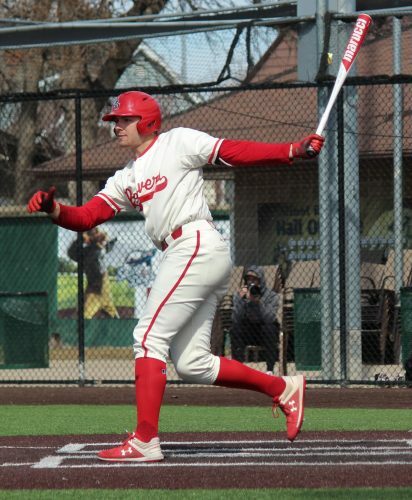 An error by the Bemidji State left fielder allowed Wright to race around all the base again for a makeshift inside the park home run that scored a run but didn’t count as a home run due to the error. Not finished yet, Wright made a diving catch in the top of the seventh inning on a ball that deflected off the roof of the bubble and managed to reach base to lead off the bottom half on a fly ball dropped by the left fielder. Julia Suchan sent a single through the left side of the infield to wave around Wright and pinch runner Melissa Estrada to tie the score at 10-10 with still no outs recorded. Suchan moved up to second base on the throw to the plate and found herself on third base after a fielder’s choice. A high fly ball to center field by Mercer made it an easy jog home for Suchan to ignite another walk-off celebration. Minot State will have a couple days to recover before hitting the road to play Wayne State on Saturday and No. 11-ranked Augustana on Sunday. Both doubleheaders are scheduled to start at noon.